(Management) Madison Square Garden L.P. Arena Financing Privately financed by bank loan and equity contribution by team ownership. In 1960, plans were announced for a fourth Madison Square Garden Center. The new site above Pennsylvania Station was selected. Garden IV opened on February 11, 1968, with a superstar-studded "Salute to the USO" concert with "Chicken Delight," otherwise known as Bob Hope "battling" former heavyweight champion Rocky Marciano. Others making guest appearances included New York City Mayor John V. Lindsay, Bing Crosby, Phyllis Diller, Pearl Bailey, Jack Dempsey, Gene Tunney and General of the Army Omar N. Bradley. As Garden IV had its opening night event, Garden III remained open during that final February weekend. Jim Ryun ran the mile in 3:57.5; the Knicks defeated the Philadelphia 76ers; and according to David Rohlfing "The final score (at MSG III) was Detroit 3, Rangers 3 in an afternoon game which was preceded by a skatearound by dozens of hockey old timers. I was there. The USO show at the new Garden was held on that same evening, February 11, 1968." It was the only time in history that two Gardens were hosting fans in separate parts of the city. Three days later the new Garden hosted its first sports event, with the home team Knicks beating San Diego, 114-102, in a National Basketball Association game. Two years later 19,500 fans watched the Knicks defeat the Los Angeles Lakers, 113-99, in the seventh game of the championship series to win their first-ever NBA title. The new sports and entertainment showplace was recognized as a magnificent complex representing a major achievement in modern construction with a circular cable-suspended roof above the arena facility and an adjacent 29 -story office building. Madison Square Garden became a subsidiary of Gulf+Western Inc., now renamed Paramount Communications Inc., in 1977. It is part of Paramount's entertainment operations, which also include Paramount Pictures and theater operations in the U.S., Canada and overseas. Paramount Communications also has operations in publishing (Simon & Schuster Prentice Hall, Pocket Books and Silver Burdett & Ginn). But, the Garden, which celebrated its centennial anniversary on May 31, 1979, is more than a building. It is the busiest arena in the country, and its worldwide reputation for excitement is built on the wide variety of headline attractions it hosts. Among the many highlights of the present Garden have been the 1976 and 1980 Democratic National Conventions, at which Jimmy Carter was nominated; the special Youth in Concert visit by Pope Paul II in 1979; the dramatic 1979 National Hockey League Stanley Cup playoff semifinal series won by the Rangers over their New York rivals, the Islanders; "The Fight" in 1971 in which Joe Frazier out-pointed Muhammad Ali; and soldout concerts by such diverse performers and artists as the Rolling Stones, Elton John, Elvis Presley, Frank Sinatra, Luciano Pavarotti, Celia Cruz, Billy Joel, Michael Jackson and Bruce Springsteen. Today, following a multi-million dollar two-year renovation project, Madison Square Garden continues as "the world's most famous arena." The 20,000-seat arena has been completely refurbished with new seating, specialty food concession areas, waiter/waitress service direct to the seats of "Club" ticket holders, a new state-of-the-art center scoreboard complete with four jumbo video screens and 88 new luxury suites. The renovation, which was completed in September of 1991, included the introduction of The Theater (formerly named The Paramount), a 5,600-seat multi-use theater and two new restaurants, the Play By Play Sports Bar and the Club Restaurant, all located directly within the facilities of Madison Square Garden itself. The Theater, named for New York's famed mecca of entertainment from 1926 to 1964, combines the latest staging, sound and lighting techniques with the same lure of star performers that the former Paramount on Forty-third Street and Broadway had. Built on the site of the former Felt Forum, The Theater, in it's inaugural year, has played host to a wide variety of shows, from Harry Connick, Jr.'s fifteen sold-out engagements and the incomparable James Taylor to world championship prize fits, an HBO Comedy Special with George Carlin and a visit by the Dalai Lama. Madison Square Garden is one of the loudest and proudest buildings in hockey, and the fans know how to generate excitement at Rangers games. Self-proclaimed "true" Rangers fans sit in the upper deck, where "Let's go, Rangers" chants spill over the rest of the crowd. Rangers fans are loyal, unforgiving and proud. Now that the team has brought home the 1994 Stanley Cup after 54 years without winning one, expect even more excitement at the Garden. Madison Square Garden is committed to continuing its rich, exciting 112 year tradition which has inspired press and performing people to proclaim it as "the center of the universe," "the world's most versatile stage," "a palace of pleasure" and "not just a building but a state of mind." Perhaps it was the Pulitzer Prize-winning sports journalist, the late Red Smith, who best summed it up when he wrote, "Madison Square Garden is, very simply, the most famous and glamorous arena in creation." From New Jersey or the south, enter Manhattan through the Lincoln Tunnel and follow signs for downtown; turn left on 34th Street. Not because of action on the ice, but what they're seeing above it. Madison Square Garden now boasts the first-ever High Definition (HDTV) scoreboard system, which includes four huge screens on its main center-hung structure and 150 smaller screens scattered throughtout the building. "The visual images are unbelievable," said Michael Juiian, senior vice president and general manager at MSG. "You've got double the resolution, twice that of what you can see at any other arena. "Fans want to see replays. Now you come to a game here, watch a replay and you can actually see the puck go into the net. Or at a basketball game, you can see the sweat on the center's face as he dunks the ball. "It's as clear as watching on television at home." In addition to adding the HDTV techology, the Garden also now has a state-of-the-art control room for operating the entire system. Backups - like five projectors for the four main screens - cover any foreseeable malfunction. MSG officials would not comment on the cost of the system. "This isn't being done anywhere else in the world," Juilian said. MSG officials expect to unveil the entire package at the Rangers' regular-season opener. 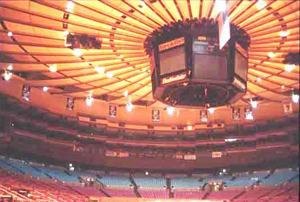 March 5, 2000 & March 17, 2002 - "Welcome to the magic world of Madison Square Garden, the world's most famous arena." Sitting atop Penn Station in the heart of Midtown Manhattan just a few blocks south of Times Square. Madison Square Garden embodies the flashiness and electricity that defines the Big Apple. Opened for business in 1968, this is the fourth arena to be named Madison Square Garden, the first opening in 1874. Along with being the home of the NBA Knicks and NHL Rangers, this arena is also home to such world renowned events as the Westminster Dog Show and the Millrose Indoor Track and Field Championships. Of couse being the Garden this place is also a hallowed boxing arena where many great bouts have taken place, most notably Ali-Frazier in 1971. Best advice ... take the subway or a train! Traffic is your typical Manhattan mess, and getting around this city is a chore. Parking can be had for $20-$25 right near the arena, and as cheap as $10 if you want to walk a few blocks. Free spaces are around but hard to find and you have to watch the restrictions on the free parking spots or you could find your car gone when you return. Two major marquees dominate the exterior of the building with one overlooking 8th Avenue and one above the 7th Avenue entrance where one can access Penn Station. On the 8th Avenue side sits the entrance to the Madison Square Garden Theatre. Once known as the Felt Forum, this 4,000 seat auditorium is the site of many plays. The main entrance to the arena is at 7th Avenue where once inside you have the option of stepping inside one of many shops and places to eat before heading up to the arena entrance. At the foot of the arena you will see an illustrious display of murals dedicated to the main tenants of the building while the floor is tiled with the names of many of the great performers who have graced the Garden floor. At the right is an escalator that takes people with preferred seating to their seat location. Get past the ticket windows and head to the many levels of escalators that will take you to your seating level. The Garden is unique in that the floor of the main arena is several stories above ground level, unlike other places where it is either at ground level or below. Generally these are somewhat narrower than in most buildings we have seen, however this building contains more concourses than what we are used to seeing, so getting around the building is not really all that difficult and there are quite a few nooks to explore.. Concessions are grouped into two "Center Food Courts", where knishes are added to the pizzas burgers and other typical ballpark dreck. Yet at the same time unsurprising since New York seems to be a no-frills, traditional sports crowd. Also, two team stores can be found at opposite baselines with a great selections of Knicks, Rangers and Liberty (wheeee!) merchandise.. This is a single level bowl with red seats in lower sections and blue seats up high as fans enter into the bowl from four different levels. Above it, all suites ring most of the arena and in some spots they are double decked. An eight sided jumbotron hangs above center court and dot matrix boards sit atop the seating area at each baseline showing out of town scores, ads, and being New York the occasional stock ticker. With New York being the center of the world, one can ignore the game and watch the celebs that sit courtside here. Our personal favorite being Spike Lee, the only one who dresses and behaves as if he is sitting next to Joe Sixpack with his unbridled enthusiasm for his(and Peter's) beloved Knicks. March 17, 2002 update...Ultimate Sports Road Trip karma??? Try jinx instead! We are now 0 for 3 in 2002 as the Detroit Red Wings scored a late goal and added an empty netter to beat the Rangers, 5-3. Pavel Bure, the Rangers need you fast!!! (hahahah). Maybe we'll have better luck on our next trip in the midwest. Yes, this building has aged and it is not complete with every last new amenity found in newer facilities. However, let's face it this is THE Garden, a place someone with the initials MJ referred to as "The Mecca of Basketball", where Willis limped onto the court in game 7, one of the famous moments in NBA history. This is one of the oldest NBA and NHL arenas in North America, yet retains an aura and elegance that is unmatched and can not be duplicated, and here you are in the center of the greatest city on the planet. There is nothing shabby, dog-eared or negative one can find here - it is truly one of sports' hallowed grounds and a venue to be experienced again and again. Madison Square Garden officials have tied their plan to build a new arena at the renovated Farley Post Office to the continuation of tax breaks the arena already enjoys. New York City officials say the move will mean an end to the $11 million-a-year benefit. The tax breaks would remain on the old arena site under the Garden's plan and arena officials say new skyscrapers built there would result in $75 million in new taxes to the city each year. The Garden's owners would profit from the move even without the tax breaks, getting about $756 million for the rights to develop the arena's current site, according to a report by stock analyst Christopher Haley of Wachovia Securities. The tax break was granted by the state legislature and several city council members have begun lobbying the representatives to dissolve the agreement that was created in 1982. The legislature approved the breaks when Gulf & Western owned the Knicks and Rangers and the firm threatened to move the teams out of the city. So far, the teams have pocketed $256.2 million, adjusted for inflation, the Independent Budget Office said. New York - A planned $500 million upgrade to Madison Square Garden has been delayed until 2012 by owner Cablevision to allow more time for planning and to see how fans react to new venues built for the Giants Mets and Yankees. Plans call for the lower bowl of the Garden to be fully renovated with 20 new event-level suites and 58 new lower-level suites in time for the 2011-12 Rangers and Knicks seasons. The upper bowl will be completed prior to the 2012-13 season. Last year, Garden executives had said the entire project, which will be done during the offseasons of the Knicks and Rangers, would be completed in time for the 2011-12 season. The project will include a 300-person super luxury suite. No decisions have been made on pricing the 5,000-square-foot space. The Garden abandoned plans for 19 "ledge suites" on the higher levels and combined 10 luxury suites to create the one supersuite since it introduced the plans a year ago. New York - Madison Square Garden, the NHL Rangers and NBA Knicks will move into a separate company under a plan approved by the Cablevision Systems Corp. board of directors. The new firm will be owned by existing shareholders and the action will take place before the end of the year. The new company will be called Madison Square Garden and will include Radio City Music Hall, Investors will get one share of the new firm for every share they hold in Cablevision. Splitting off Madison Square Garden will allow Cablevision to focus on its more profitable cable- television business and could lure potential buyers for the company, such as Time Warner Cable or Comcast, Bloomberg News reported, citing comments made by Pali Capital analyst Rich Greenfield earlier this month. 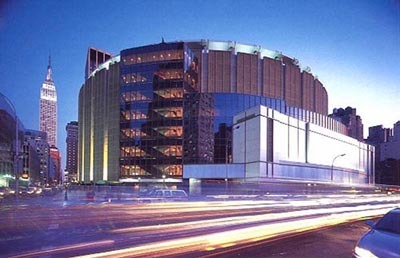 New York - New filings with the federal Securities and Exchange Commission show that the new Madison Square Garden LLC will start life with a $190 million payment from previous owner Cablevision to add to its $62 million in cash. The filings also reportedly show that 12 percent of the firm's revenue last year - $120 million - came from the Radio City Christmas Spectacular at Radio City Music Hall. Also this week, the firm acknowledged that it is scouting the Washington, D.C. area for a place to build a 6,000-seat concert venue. The company is in the preliminary stages of exploring where a venue might be located. No deadlines have been announced. The firm's financial filing shows that MSG is a wildly volatile business that's highly dependent on the economy and the fortunes of its sports teams. In the last six years, the unit has swung between being highly profitable to getting deeply in red ink. In 2004, for example, MSG posted a profit of $50 million, but is on track to record a loss this year, if the $5.8 million in losses for the first six months of this year is any indication. Known primarily for the New York Knicks and New York Rangers sports franchises, the biggest economic driver for MSG is its media segment, which houses the MSG and Fuse cable networks. It accounts for around 40 percent of the company's overall revenue. The balance is split between its sports and entertainment divisions. The media operation is also the only division posting growth, with revenue through June 30 growing by $18 million to $232 million. By contrast, the entertainment segment saw revenue fall by $11 million to $79 million during the period, and the sports segment slipped $1.6 million to $210 million. The decline in sports-segment revenue stems in part from a charge of $23.5 million "associated with transactions relating to players on our sports teams for career-ending injuries and for waivers and termination of players and other team personnel, including team executives." The filing also outlines the company's view on the planned renovation of Madison Square Garden. * A new suite configuration that includes: 58 new lower-level suites that are 50 percent larger than our current suites and half the distance to events - 20 new event level suites, which include the best seats in the house - One super suite, which is the size of 10 traditional suites. "We continue to review all aspects of this complex project with our consultants in order to improve the renovation plans, mitigate project risks and identify efficiencies in all aspects of costs, planning and project-phasing. We also continue to develop our cost and capital investment estimates to ensure that the planned renovation meets our overall expectations and objectives. "While the pre-construction planning and cost estimates of this renovation are not yet final, we currently expect that the project's cost will be materially higher than our original estimate of $500 million. We expect that the estimated costs associated with the project will be met from cash on hand, receipt of repayments of advances made to a subsidiary of Cablevision and cash flow from our operations. "To the extent that management determines that outside financing is required or desirable, we intend to raise that financing. In order to most efficiently and effectively complete the renovation, it will be a year-round project. Our goal into minimize disruption to current operations and to achieve this, The Garden will remain open for the New York Knicks' and New York Rangers' seasons while we sequence the construction to ensure that we maximize our construction efforts when we close the arena during summer months. Our current expectation is that the renovated lower bowl will be open for the 2011-12 seasons and that the renovated upper bowl will be open for the 2012-13 seasons." Cablevision Systems Corp. said its board has approved the spinoff of its Madison Square Garden Group. The unit, which has been a drag on Cablevision earnings, includes the famous sports arena, Radio City Music Hall and the New York Knicks and Rangers. On Feb. 9, Cablevision plans to distribute one Madison Square Garden Class A share for every four shares of Cablevision Class A stock held as of Jan. 25. Cablevision's Class B shareholders will get the same distribution in Madison Square Garden Class B shares. Coca-Cola and Delta Airlines have become �Signature Partners� for the renovated Madison Square Garden in New York. MSG is signing up sponsors for the project which is expected to cost up to $850 million when completed in 2012. Terms of the agreements were not disclosed. New York - The three year project to upgrade Madison Square Garden begins this summer and will reduce the number of events that will be held at the venue. Turner Construction is renovating the arena and needs about 20 consecutive weeks from the end of play. The renovation will cost $775 million to $850 million, much higher than the $500 million estimate made by Garden officials when they first unveiled plans in April 2008. Hank J. Ratner, the Garden's president and chief executive, said that the lower figure was based on a design concept that had not been fully fleshed out. The current estimate is based on elaborate drawings of every element of the construction plan. The Garden is financing the renovation with cash on hand and operating cash flow, Ratner said. The Garden spent $60 million to start the renovation in areas not visible to the public through the end of 2009. Ratner declined to say how much has been spent since or how much the Garden, which hosts about 300 events a year, is giving up in revenue for events that cannot be booked during the closures. One of its properties, the Liberty of the WNBA, will have to play home games elsewhere beginning in 2011. A possibility is the Prudential Center in Newark, where the Nets will play for two seasons before moving to their new home in Brooklyn. The MSG Network has begun moving across Seventh Avenue to a new space at 11 Penn Plaza. After the NBA. draft on June 24, the Theater at Madison Square Garden will be closed to support the work that is needed to support the construction of the upper floors. The Theater does not need renovation and is expected to reopen in the fall. 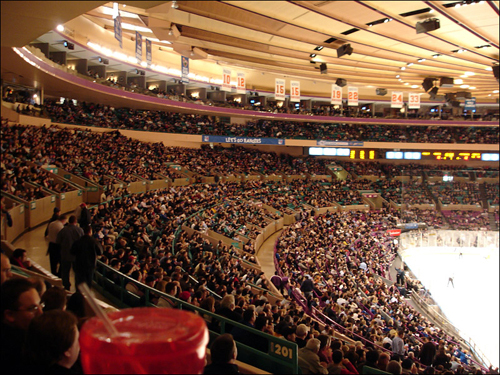 In October 2011, the Garden plans to reopen with its lower bowl seats refurbished and the 20 event-level suites, which are at or near the ice or the basketball court, ready to be occupied at rents of about $1 million each. Ratner said nearly all of the swank suites were spoken for. New locker rooms, dressing rooms for entertainers and the news media area will be ready, as will the new sixth-floor concourse, which will be widened to include windows but will have a temporary ceiling and floor. About 1,500 seats in the upper bowl will be covered at the start of the 2011-12 season, but Ratner said they should be finished early in the season. Most of those seats are not committed to season-ticket holders, but those who have seats will be temporarily relocated. When the arena reopens after the summer of 2012, Ratner said, the upper bowl seating is expected to be done, with all seats moved closer to the action. Twenty-two lower-level suites, some as close as 23 rows from the floor or the ice, will be ready to start the season, with 36 more finished by the end of the year. Construction will take place when games are not being played. Also opening in October 2012 will be a partly finished upper-level concourse, a party deck and the Super Club, an area the size of 10 suites. The Delta Club, which will serve patrons of the elite event-level suites, will also open, with a television studio and a glass wall that will look into the tunnel where players can be seen as they walk from the locker rooms to the court or ice. In October 2013, the final phase - the open-air, two-level Seventh Avenue lobby - will open with large projection screens and a television studio. On the ninth floor, 18 revamped suites will open and a new scoreboard will be installed. And one of the signature design elements of the renovated Garden - two bridges that will span the arena lengthwise, and serve the concourses and seating areas - will open. New York - A developer hopes to convince Madison Square Garden officials to abandon their plans for an $850 renovation of the current arena and instead build a new facility one block west. The renovation project is scheduled to begin this summer and take three years. Steven Roth, chairman of Vornado Realty Trust, has been talking with Garden and city officials. Garden executives insist that they are moving full speed ahead on their renovation. They moved their television network to 11 Penn Plaza last week in preparation for the first stage of construction and will temporarily close the Garden's 5,600-seat theater at the end of June. Reports say the developer's pitch to the Garden suggested that renovation of the 42-year-old arena could be more expensive and more disruptive for the Knicks, the Rangers and the Liberty than anticipated and that the finished product may be inferior to the new arena for the New Jersey Nets that is under construction in Brooklyn. Instead, Roth has reportedly proposed a stripped-down version of a $14 billion proposal that collapsed in 2008. Civic and business groups had embraced the idea of moving the Garden to transform Penn Station into a grand transit hub for the 550,000 daily commuters who already use it. But the 2008 proposal also involved the creation of a special zoning district that would have allowed development rights to be sprinkled around the neighborhood, enabling Vornado to build a forest of new skyscrapers. Now, Roth is proposing to scrap the zoning district and the development rights transfer. He would simply move the Garden into a new arena that would be built within the walls of the James A. Farley Post Office, which sits across from the Garden. The post office would also become an adjunct for an expanded Penn Station, which would be renamed Moynihan Station. The postal operations, which occupy the Eighth Avenue lobby of the block-long building, would remain. The old arena, in turn, would be razed to make way for a huge retail mall and improvements to the train halls and corridors below. Roth is reportedly motivated by both his investment in the neighborhood and a desire to enliven the planned renovation of the post office. He and his partner, Stephen Ross of the Related Companies, are renegotiating their 2005 deal with the state to turn the post office into Moynihan Station. 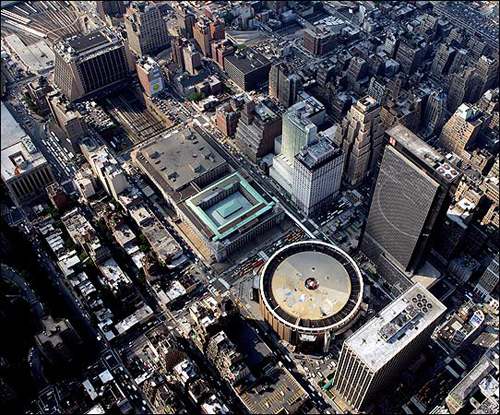 New York - A pair of sky bridges are planned to span the playing floor of the renovated Madison Square Garden. The bridges will be five floors above the playing surface. "This is our signature element. It will be a unique experience in sports and entertainment," Hank Ratner, CEO of Madison Square Garden, said. Rather than merely renovate the Garden, the project calls for building an entirely new arena in the shell of the 1968 building, he said. "This gives us the best of both worlds. We keep what's iconic - the exterior and the famous ceiling - and create a whole new building," Ratner said. Construction will start in earnest on June 14 and go through several phases over the next four years, moving from the bottom up. The work, which will not disrupt the Knicks or Ranger season, will occur mostly in summer. After conducting focus groups with fans, MSG officials found that the biggest complaints were over the arena's lobby, its narrow concourses, the limited food choices, the lack of bathrooms and the poor sightlines at the higher levels, Ratner said. One longtime complaint about the Garden is that the building gives no sense of its location in the heart of Manhattan. By moving out most of the office space, the revamp will turn the lower concourse into a wide thoroughfare with city views, shopping and a slew of high-end dining options. Also, as part of the first phase, to be completed for the 2011-12 season, is the addition of 20 event-level suites. Located below courtside and featuring kitchens, bathrooms, fireplaces and dining rooms, the suites lead right up to the best seats in the house. The following year, the arena's upper bowl will be redone. The new seats will all be more plush, and the angle of the bowl's incline will be increased 17 degrees to bring fans closer to the action. This phase will include the addition of 58 lower-level suites, which would be larger and closer to the action than the ones in the current Garden. The sky bridges and new lobby are set to be completed for the 2013-14 season, along with a party deck on the 10th floor and remodeled upper-level suites. Sky bridge pricing has not been set, but the courtside suites reportedly sold for up to $1 million. New York - Madison Square Garden, one of the few public sports owners, reported a 9.5 percent increase in revenues in the second quarter. The company owns the New York arena that bears its name along with the NHL Rangers, AHL Hartford Wolf Pack, NBA Knicks and WNBA Liberty. Other venues include Radio City Music Hall, the Theater at Madison Square Garden, the Beacon Theatre, the Chicago Theatre and the Wang Theatre. Second quarter revenues totaled $227.1 million. The firm said the increase came primarily from its media and entertainment segments. "Adjusted operating cash flow increased 303.7 percent to $42.4 million and operating income increased $34.5 million to $25.7 million, as compared to the second quarter of 2009," the company reported. "On an overall basis, AOCF and operating income growth were primarily driven by higher MSG Media revenue and lower operating expenses in the MSG Sports segment." MSG Sports revenues for the second quarter 2010 decreased 6.9 percent to $63.9 million. The company said the decrease in revenues was primarily attributable to a decline in sports team playoff revenues and the absence of a marquee arena boxing event such as the one held in the second quarter of 2009, partially offset by higher broadcast rights revenue and regular season sports team ticket revenue. AOCF for the sports segment improved by $19.4 million to $3.5 million while the segment's operating income improved by $19.9 million to $0.6 million. The improvement in AOCF and operating income mainly reflects lower sports team operating costs and lower selling, general and administrative expense. New York - JPMorgan Chase has signed on with Madison Square Garden for a new sponsorship in the renovated arena, the companies say. Terms were not disclosed. JPMorgan Chase will become a Marquee Partner in a deal that includes exposure at the arena, the Theater at Madison Square Garden, Radio City Music Hall, Beacon Theatre, Chicago Theatre, the Radio City Christmas Spectacular, and with the New York Knicks, New York Rangers, New York Liberty. The agreement includes regional television networks and digital platforms. "With this new partnership, JPMorgan Chase customers across many of the firm's lines of business will receive exclusive access to events and unique experiences across Madison Square Garden's venues and sports and entertainment franchises," the companies said in a press release. "From access to sold out concerts and events to behind the scenes experiences with athletes and performers, JPMorgan Chase will be able to provide its customers with one-of-a-kind, can't buy opportunities at the over 1,200 live entertainment and sports events at MSG's New York and Chicago venues annually." At the arena, the new 7th Avenue entrance will become the Chase Square and feature interactive kiosks, new retail locations and a broadcast area. Inside the Arena the two Chase Bridges will be suspended above the floor, the firms said. "The 1879 Club presented by J.P. Morgan will be an exclusive new space that provides event attendees with a casual and intimate environment to relax before or after an event. New Madison Square Garden 7th and 8th Avenue marquees will also feature permanent JPMorgan Chase branding," the release said. Madison Square Garden will reopen Friday evening after concerns about asbestos after debris fell from the attic of the building earlier in the week. Tests conducted by New York's Department of Environmental Protection and by independent contractors concluded that no asbestos had been released into the arena, the New York Times reported. Garden officials postponed Tuesday night's game between the Knicks and the Orlando Magic so the tests could be run. New York - Madison Square Garden has settled a multimillion-dollar lawsuit accusing it of continuing to serve alcohol to drunk Jersey City cop who was then in a crash on the Pulaski Skyway that killed a toddler and left the boy's mother with massive brain trauma, the New York Post reported. The Garden settled with Carlos Zelaya, whose 2-year-old son, Jose Carlos, died a few days after the Jan. 23, 2007, collision with the speeding Jeep Cherokee driven by off-duty officer Kevin Freibott, 42, of Red Bank, the newspaper said. Ruth Zelaya, 40, of Jersey City, and San Pedro Sula, Honduras, died on March 24 as a result of "complications from the motor vehicle collision," prosecutors said at the time. The amount of the settlement was not disclosed but is estimated to be about $8 million, the sum the Zelaya family still owed for Ruth Zelaya's medical care during the three years she was in a near vegetative state, the Post said. Freibott pleaded guilty and was sentenced in 2008 to 11 years in prison. New York - Madison Square Garden Inc., one of the few companies that publicly reports revenues from venues, reported that full year 2010 revenues increased 8.9 percent to approximately $1.2 billion compared to 2009, primarily reflecting an increase in revenue in the company's MSG Media and MSG Entertainment segments. Adjusted operating cash flow (AOCF) increased 68.1 percent to $202.8 million and operating income increased 198.7 percent to $134.5 million, both as compared to 2009, the company said. Full year net income of $83.4 million ($1.09 per diluted share) increased 201.6 percent versus $27.6 million ($0.38 per diluted share) in 2009. 2010 year-end cash and cash equivalents totaled $354.5 million versus $109.7 million at 2009 year-end. Fourth quarter 2010 revenues increased 5 percent to $432.7 million compared to the prior year period, primarily reflecting an increase in revenues in the company's MSG Media and MSG Sports segments. Fourth quarter adjusted operating cash flow increased 10.6 percent to $69.6 million and operating income increased 19.2 percent to $52.4 million, both as compared to the fourth quarter of 2009. AOCF and operating income growth were driven by higher MSG Media revenues. Fourth quarter net income of $32.7 million ($0.42 per diluted share) increased $9.3 million compared to net income of $23.4 million ($0.32 per diluted share) in the prior year period. Madison Square Garden President and CEO Hank Ratner said: "Madison Square Garden had a historic year in 2010 as we successfully completed our spin-off from Cablevision and became an independent public company. We achieved the highest level of AOCF in Madison Square Garden's history, a reflection of our strategy to use our unique assets across media, entertainment and sports to generate enhanced returns." The company has begun major renovation of its New York arena. The company said advertising revenues increased $3.9 million compared to the year-ago quarter. AOCF for MSG Media increased 25.4 percent to $51.7 million and operating income rose 32.5 percent to $46.7 million, both as compared to the fourth quarter of 2009. The increases in AOCF and operating income primarily reflect the growth in affiliate fee and advertising revenue, partially offset by higher direct operating and selling, general and administrative expenses. MSG Sports revenues for the fourth quarter 2010 increased 4.1 percent to $128.7 million. The company said the increase in revenues was primarily attributable to higher sports team ticket sales, league distributions, sponsorship and signage and other revenues. This increase was partially offset by a decline in revenue from other live sporting events. AOCF decreased 15.8 percent to $3.2 million and operating income decreased by $1.0 million to a loss of $0.6 million, both as compared to the fourth quarter of 2009. The decrease in AOCF and operating income mainly reflects higher selling, general and administrative expense, as well as $2.4 million in certain team personnel transaction expenses, partially offset by higher revenues, the company said. New York - Madison Square Garden Inc. shares could be worth more than $50 apiece, 81 percent above where they currently trade, helped by renovations to its namesake arena and improved performance by the New York Knicks professional basketball team, Barron's said in its April 11 edition. According to the financial newspaper, the nearly $1 billion, two-year make-over of the aging Garden arena, home to the Knicks and New York Rangers hockey team, will considerably improve cash flow by expanding luxury suites and concession space, and installing billboards that display ads based on audience demographics. The Knicks are also performing better, having made the National Basketball Association playoffs for the first time in seven years. According to Barron's, close to half of MSG's revenue and all of its operating profit in 2010 came from its media unit, which largely includes the cable networks MSG Networks and MSG Plus. Barron's said some of MSG's value could be unlocked if the Dolan family, its controlling shareholder, tries to take the company private, as some investors expect. It cautioned, though, that some analysts believe MSG shares could fall to $20 if the home teams stumble, its entertainment unit continues to lose money, or NBA players go on strike after their contract runs out following this season. MSG shares closed last week at $27.61 on the NASDAQ. New York - The Bergen Record says the upper-bowl renovation of Madison Square Garden is to be completed by the autumn of 2012, while bridges across the width of the arena - a new element - are to be completed for the 2013-14 seasons. A key element of the transformation will be a remodeling of the main entrance on Seventh Avenue, which MSG Sports president Scott O'Neil told the newspaper currently is "uninspiring, to say the least." Still, O'Neil said that he wants to preserve some of the same feel of the traditional Garden. He said that as "magnificent" as the new Yankee Stadium is, he recalls growing up watching first baseman Don Mattingly, and the new version "is not that park anymore." A key project this summer will be the 20 premium "event level suites" that O'Neil described as being sold for more than $1 million, with only one such suite still unsold. There are 50 "Madison level suites," which O'Neil said are 75 percent sold at a price of $600,000 to $950,000. Five of the 16 upper-level suites, O'Neil added, will be reserved for single-game sales because of the level of interest in such offerings. The Record said O'Neil downplayed an expected rivalry with the Nets' Barclays Center in Brooklyn, which is scheduled to open in September 2012. "The five boroughs and Connecticut and New Jersey are Knicks country," O'Neil said. "We wouldn't single out a certain borough." Sporting, media and entertainment company The Madison Square Garden Co. said its second-quarter earnings sank 39 percent, as a renovation project that closed its famous arena and theater for much of the quarter affected revenue. The company earned $8.5 million, or 11 cents per share, in the three months that ended June 30. That compares to net income of $14 million, or 18 cents per share, in the same quarter last year. Revenue grew three percent to $233.8 million. The company's MSG Entertainment revenue dropped 23 percent to $36 million in the quarter, mainly due to lower event-related revenue from Madison Square Garden and the Theater at Madison Square Garden. The Manhattan arena is getting an $850 million upgrade that includes gutting its interior from the ground up. MSG Media revenue climbed four percent to $139.6 million, and MSG Sports revenue rose 18 percent to $75.4 million, mainly due to higher playoff-related revenue. MSG Sports owns and operates the Knicks, Rangers, the WNBA's New York Liberty and the Connecticut Whale minor league hockey team. New York - Madison Square Garden Co. reported revenues of $46.1 million in its first fiscal quarter, up nine percent from the same period a year earlier. The company recently changed its fiscal year to end on June 30. Operating income of $26.4 million increased 0.4 percent and net income of $21.3 million increased 10.5 percent, both as compared to the prior year period. Cash and cash equivalents as of September 30, 2011 totaled $228.6 million. President and CEO Hank Ratner said: "We generated solid AOCF (adjusted operating cash flow) growth in the first quarter of our new fiscal year, as we successfully managed our business through the offseason shutdown of The Garden and the Theater at Madison Square Garden. We re-opened The Garden on schedule in late October and are pleased with the progress we have made on all fronts with respect to the transformation project. We remain focused on our company's business objectives and are confident in our ability to drive long-term growth." For the fiscal 2012 first quarter, MSG Media revenues of $138.6 million rose 3.9 percent, as compared to the prior year period. Affiliate fee revenue increased $4.5 million, as compared to the prior year period, primarily attributable to higher affiliation rates, with the overall increase being significantly offset by the impact of the previously disclosed expiration of certain affiliation agreements. Advertising revenue increased $1.2 million, as compared to the prior year quarter. AOCF of $63.8 million increased 14.6 percent and operating income of $57.2 million increased 13.7 percent, both as compared to the prior year period. The increase in AOCF and operating income primarily reflects higher affiliate fee and advertising revenues and, to a lesser extent, lower selling, general and administrative expenses, the company said. For the fiscal 2012 first quarter, MSG Entertainment revenues of $27.6 million decreased 27.7 percent, as compared to the prior year period. The company said the decrease in revenues was primarily attributable to lower event-related revenues at The Garden, reflecting the scheduled offseason shutdown of The Garden, and the absence of a co-production, with the overall decrease partially offset by higher revenues at Radio City Music Hall and the Beacon Theatre. AOCF loss of $13.8 million increased by 26.2 percent and operating loss of $17.2 million increased by 23.5 percent, both as compared to the prior year quarter. The increase in AOCF loss and operating loss primarily reflects lower event-related results at The Garden, partially offset by improved results at Radio City Music Hall and the Beacon Theatre. For the fiscal 2012 first quarter, MSG Sports revenues of $28.8 million decreased 21.9 percent, as compared to the prior year period. The decrease in revenues was primarily attributable to the offseason shutdown of The Garden, including lower professional sports team pre/regular season ticket related revenue, event-related revenues from other sporting events and suite rental fee revenue. AOCF decreased by $2.0 million to a loss of $0.5 million and operating loss increased by $2.4 million to a loss of $4.1 million, both as compared to the prior year quarter. The decrease in AOCF and increase in operating loss primarily reflects the decline in revenues, partially offset by lower direct operating and selling, general and administrative expenses, the company reported. New York - The Madison Square Garden company says the fiscal 2012 second quarter revenues of $373.0 million decreased 13.8 percent, as compared to the prior year period, primarily reflecting a decrease in revenues in the MSG Sports segment, due to the NBA work stoppage, and, to a lesser extent, a decrease in revenues in the MSG Entertainment segment. "In particular, our MSG Entertainment segment was a strong performer for the second quarter, driven by our recent initiatives with respect to the Radio City Christmas Spectacular franchise," said company president and CEO Hank Ratner. For the fiscal second quarter, MSG Entertainment revenues of $151.2 million decreased 14.8 percent, as compared to the prior year period, primarily due to the lower number of scheduled performances of the Radio City Christmas Spectacular production outside of the New York market and the absence of the Wintuk production, which concluded its planned four-year run during the 2010 holiday season. The overall decrease was partially offset by increased revenues for the Christmas Spectacular production at Radio City Music Hall and higher event-related revenues at the Theater at Madison Square Garden (excluding Wintuk) and the Beacon Theatre. MSG Sports revenues of $88.6 million decreased 31.2 percent, as compared to the prior year period, due to the NBA work stoppage, which impacted nearly all components of MSG Sports revenues. The overall decrease in revenues included lower professional sports team pre/regular season ticket related revenue, broadcast rights fees, league distributions, food, beverage and merchandise sales, and sponsorship and signage revenue, partially offset by higher event-related revenues from other live sporting events. Adjusted operating cash flow decreased by $23.1 million to a loss of $19.9 million and operating loss increased by $23.6 million to a loss of $24.2 million, both as compared to the prior year quarter, primarily reflecting the decrease in revenues, partially offset by lower direct operating and selling, general and administrative expenses, mainly due to the NBA work stoppage. The overall decrease in direct operating expenses was partially offset by a $7.5 million increase in provisions for certain team personnel transactions, the company said. MSG Media revenues of $142.4 million decreased 1.2 percent, as compared to the prior year period. Affiliate fee revenue increased $4.0 million, as compared to the prior year period, primarily attributable to higher affiliation rates, with the overall increase offset by the impact of a contractual adjustment and the previously disclosed expiration of an affiliation agreement. Advertising revenue decreased $5.7 million, as compared to the prior year quarter, primarily attributable to a lower number of NBA games telecast on MSG Networks due to the work stoppage. New York - Madison Garden will open the Madison Club and a new wave of 176 luxury seats next season as part of the second round of renovations for the arena. Ticket holders will get access to not only every Knicks game, but every New York Rangers game and all other sporting events at the Garden. Dog shows are not included. Fox Sports said individual tickets for the Madison Club start at $42,500 a year and will be sold in packs of two and four. But unlike most traditional season tickets, the package comes with access to a club roughly the size of 10 corporate suites. The club offers free gourmet food, a private bar and private restrooms. For fans wanting to go to every Knicks and Rangers home game next season, the Madison Club tickets are the only option left without paying for a private suite. Individual season tickets for both teams have already sold out for next season. Scott O'Neil, president of MSG Sports, said tickets have been on sale for about three weeks and have been selling "at a good clip." But for now, the Madison Club is still a work in progress. That portion of the arena is under construction and will not be ready until the start of the next season. The Garden wrapped up the first phase of its $980 million top-to-bottom overhaul last summer, adding new court-side suites, two clubs for elite season ticket holders called the 1879 Club and the Delta Club and revamping the locker rooms for the Knicks and Rangers. The bulk of the work has been taking place during the summer months. MSG officials plan for the entire makeover to be complete by the 2013-14 season.